The WHO Classification of Digital Health Interventions (DHIs) categorizes the different ways in which digital and mobile technologies are being used to support health system needs. Historically, the diverse communities working in digital health—including government stakeholders, technologists, clinicians, implementers, network operators, researchers, donors— have lacked a mutually understandable language with which to assess and articulate functionality. A shared and standardized vocabulary was recognized as necessary to identify gaps and duplication, evaluate effectiveness, and facilitate alignment across different digital health implementations. Targeted primarily at public health audiences, this Classification framework aims to promote an accessible and bridging language for health program planners to articulate functionalities of digital health implementations. The WHO Classifications of Digital Health Interventions v1.0 is the result of a multi-year process of development and refinement guided by a panel of global experts, including those from the Health Data Collaborative Digital Health and Interoperability Working Group. For more information about this resource, visit the WHO website. Home-based records (HBRs) are an important tool for recording and communicating within primary healthcare service delivery. Unfortunately, HBRs are currently unable to fulfil their intended purpose in many communities either because the HBR is not functionally well-designed to serve its objectives, not made available, not fully adopted and/or not appropriately utilized by caregivers and/or health workers. This brief report describes the occurrence of nationally reported HBR stock-outs and HBR financing patterns during 2014 and 2015 across 195 countries reporting immunization system performance data to the World Health Organization and United Nations Children’s Fund. During this two and a half day meeting, participants discussed and shared their experiences and lessons learned regarding the development and implementation of EIRs. Furthermore, the meeting participants reviewed the proposed contents of a draft document under development by PAHO’s Improving Data Quality for Immunization (IDQi) Project. FULFILLING A PROMISE: ENSURING IMMUNIZATION FOR ALL IN AFRICA See the official conference report for a look at the current state of immunization on the African continent. A new report issued today by the World Health Organization (WHO) Regional Office for Africa and the Eastern Mediterranean Region shows that despite considerable progress in expanding access to vaccines in Africa, one in five children on the continent still do not receive life-saving immunizations. Africa’s routine immunization coverage of 80% is the lowest of any region in the world. 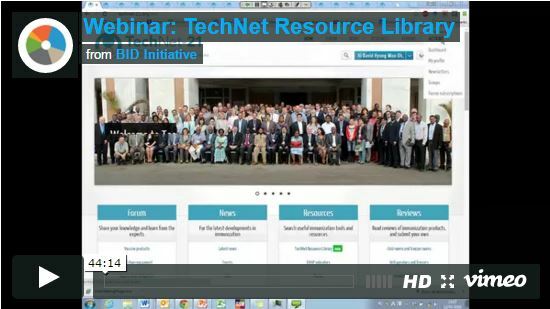 The Better Immunization Data Learning Network (BLN) held a webinar entitled “TechNet Resource Library” about this online repository of journal articles, documents, tools, websites, and other immunization resources. The Global Vaccine Action Plan (GVAP) was endorsed by the World Health Assembly in May 2012 to achieve its “Decade of Vaccines” vision of universal access to immunization. This report provides a review of the progress on implementation of the GVAP by the World Health Organization’s Strategic Group of Experts on Immunization. It notes that the plan is off track to reach the GVAP targets and provides recommendations for actions required to meet the goals and objectives of the plan. This report follows 2014 and 2013 assessment reports. Historically, the introduction of new vaccines in developing countries has been delayed due to lack of a coordinated effort to address both demand and supply issues. The introduction of vaccines in developing countries has been plagued by a vicious cycle of uncertain demand leading to limited supply, which keeps prices relatively high and, in turn, further increases the uncertainty of demand. The Pneumococcal Vaccines Accelerated Development and Introduction Plan (PneumoADIP) is an innovative approach designed to overcome this vicious cycle and to help assure an affordable, sustainable supply of new pneumococcal vaccines for developing countries. Translational research will play an important role in achieving the goals of PneumoADIP by establishing the burden of pneumococcal disease and the value of pneumococcal vaccines at global and country levels. If successful, PneumoADIP will reduce the uncertainty of demand, allow appropriate planning of supply, and achieve adequate and affordable availability of product for the introduction of pneumococcal vaccines. This model may provide a useful example and valuable lessons for how a successful public-private partnership can improve global health. The aim of this guide is to help health workers to use their own data to identify problems and causes of low immunization coverage, and to plan solutions to increase immunization coverage. These guidelines can be modified to suit the local context and needs, and can be used at various levels of the health system in any country.